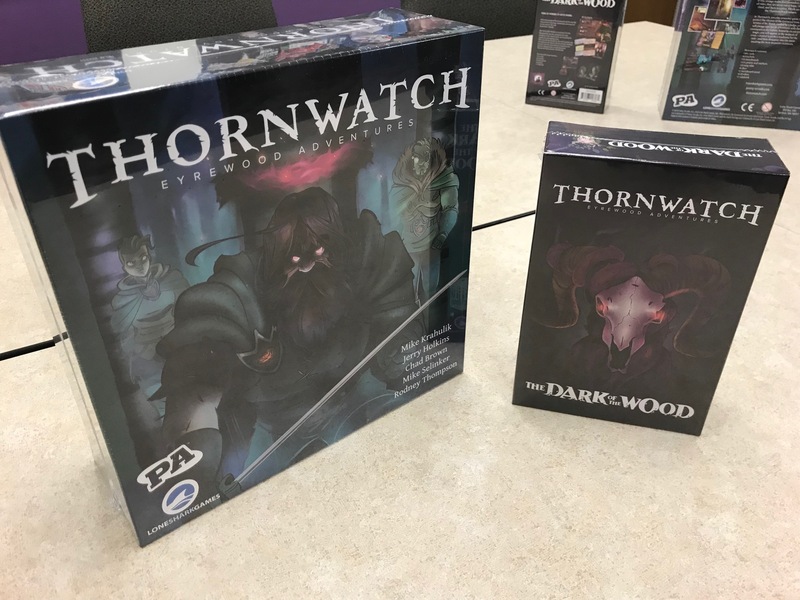 We are very excited to announce that two of our biggest projects, The Ninth World and Thornwatch, are about to be fulfilled to backers. They will then go on sale on our site and in retail stores everywhere. So if you missed the Kickstarter for either or both of these cool games, you will soon have the chance to get them. Also, see below for details on our presence at PaizoCon this month and Origins next month, as well as registering for our events at Gen Con. 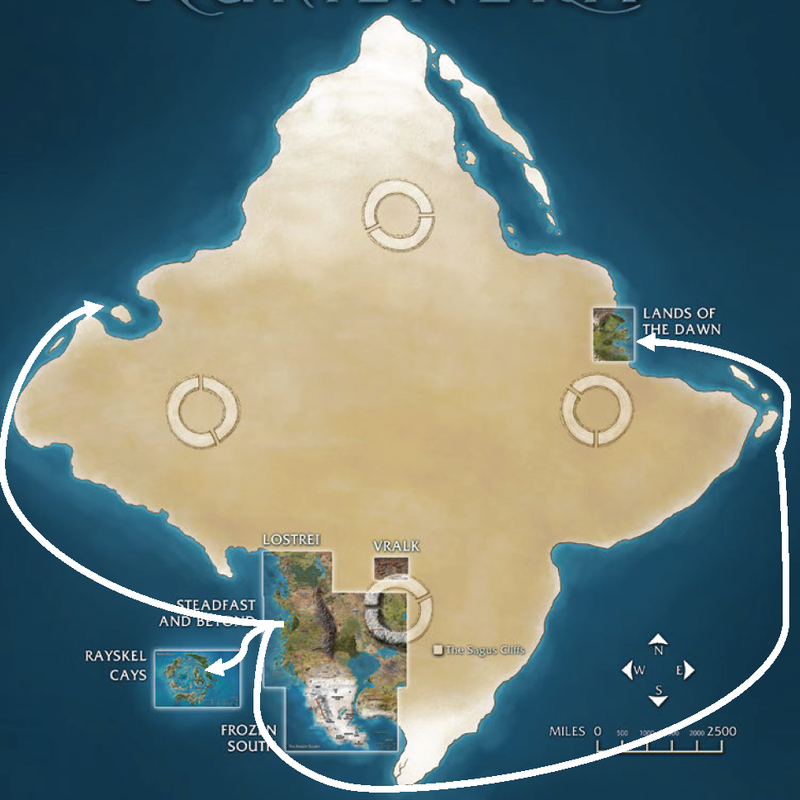 The Ninth World is all done. It looks like this. That’s one of the coolest boxes we’ve made. The game is now on boats from Shanghai to the USA, United Kingdom, and Australia. All of them will arrive at their ports of distribution this month. This is what the process looks like to us. What we know from here is that once all the boats land, they will meet up with cases of our promo cards and signed playmaps. They will all be fulfilled through our friends at Quartermaster and then go out to distribution thereafter. We hope to be done with as much of this as possible by mid-June so we can bring the game to the Origins Game Fair (see below). We’ve also signed a whole bunch of playmaps. We’ll have a few more of these available for purchase once the game goes live on our site and the Monte Cook Games site. 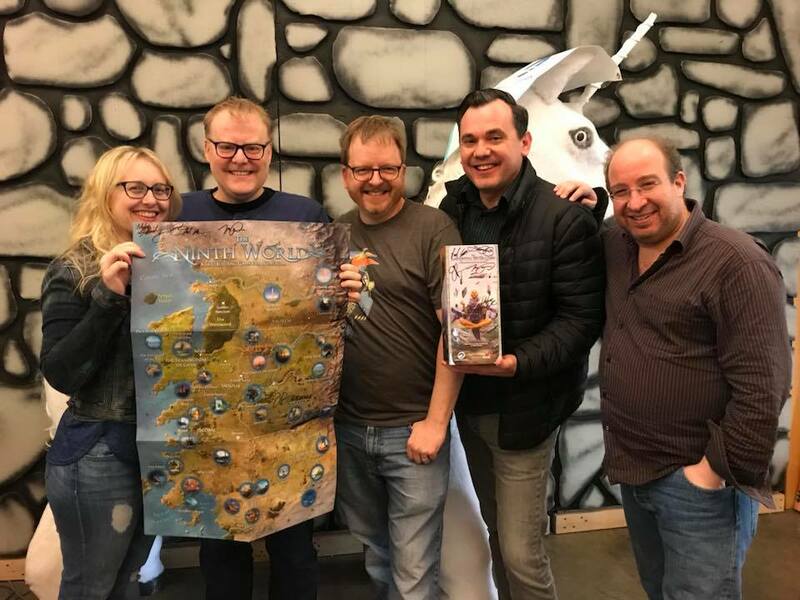 Here’s MCG’s Shanna Germain and Monte Cook with co-designers Paul Peterson, Bo Radakovich, and me holding a signed map and game box. There is also a hidden unicorn. 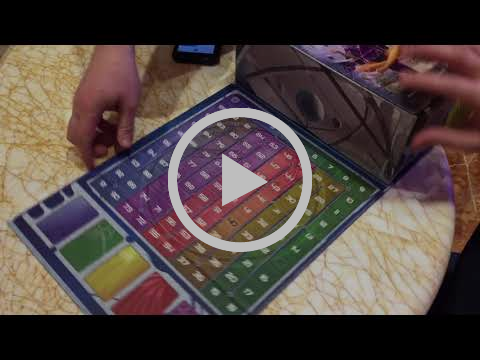 Here’s us unboxing the game. 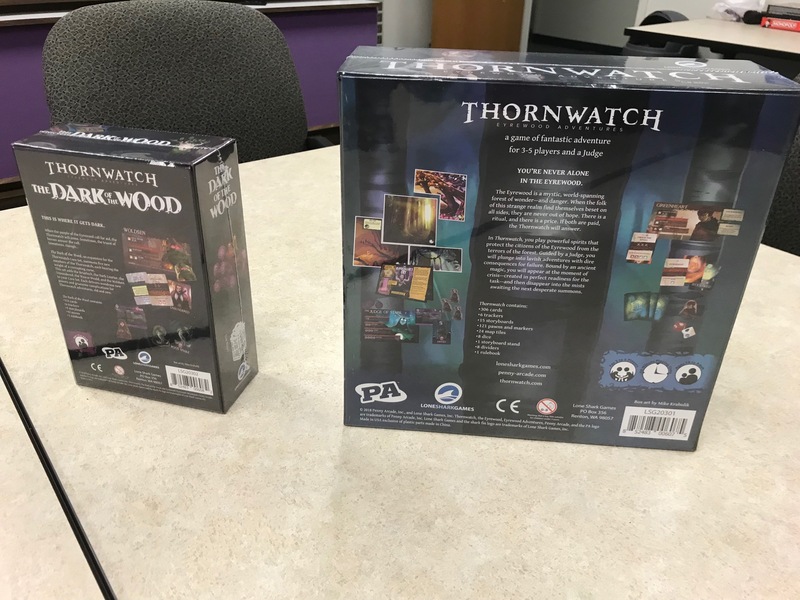 Thornwatch and its companion expansion The Dark of the Wood arrived in our Seattle warehouse late last week. We had it printed in Massachusetts at the factory that coincidentally makes all of Hasbro’s family games, leading to this rather strange picture. The game came out amazing. Here’s what it looks like from the front and back. We’re beginning a complex process of getting our Kickstarter backers their games now. This involves signing a lot of copies and getting them sent around the world. Once we get that done, Penny Arcade and Lone Shark will put it on sale for new customers. 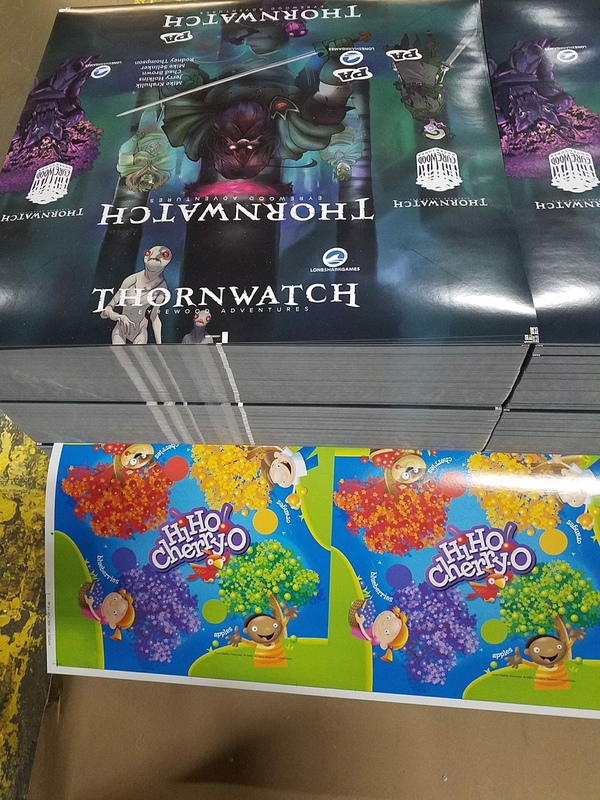 We are very excited to get Thornwatch out to everyone soon. 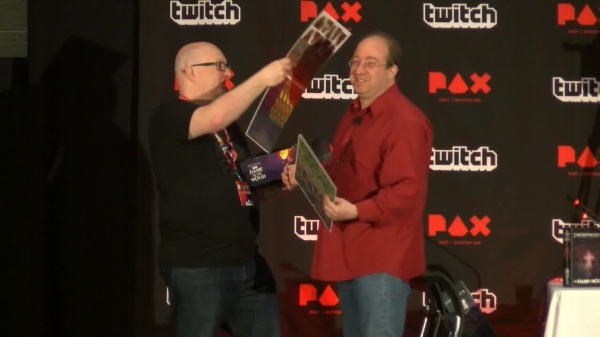 Here’s Jerry Holkins and me unboxing the game and playing it with friends onstage at PAX East. We’re spending a lot of time getting ready for some of the biggest shows of the year. Here’s some info you need if you’re going to PaizoCon, Origins, or Gen Con. 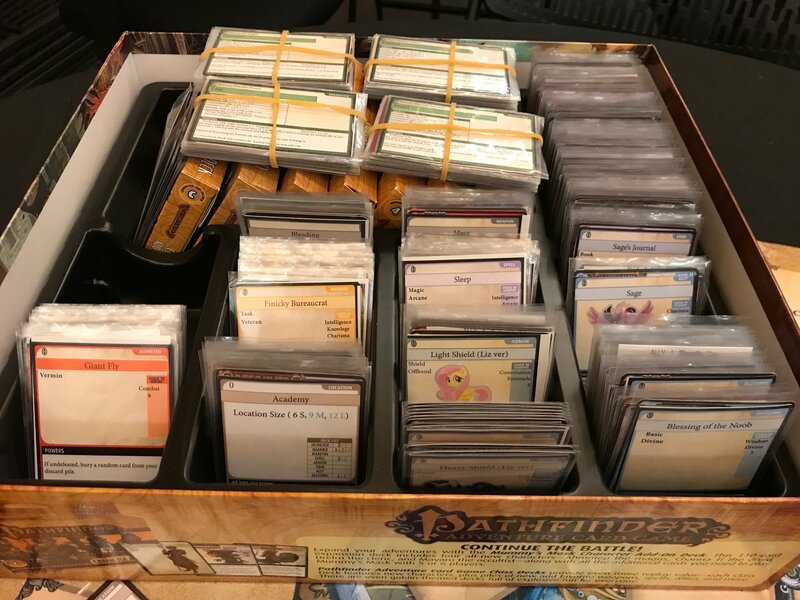 At PaizoCon in Seattle next weekend, we’ll be debuting the playtest version of our upcoming Pathfinder Adventure Card Game Core Set. This is a big format change for our long-running game. We’re hoping to get tons of feedback, so if you’re coming, please go here and sign up. The Ninth World and Thornwatch will be featured in our booth at Origins Game Fair, June 13-17 in Columbus, Ohio. Early bird registration closes for Origins on June 1, so if you’d like to play with us there, get your registration in soon. And as always, James Ernest, Paul Peterson, and I will be broadcasting every night from the Big Bar on 2 with all of our favorite industry guests. Gen Con event registration opened this weekend, and if you look at the Lone Shark Games event page from your logged-in account, you will only see five events, two of which are already sold out. That’s not our intent. In this wave, Gen Con put only one instance of each of our events in the system, but we plan for there to be dozens of them. Gen Con says they’ll all be up in the next couple weeks. So please keep checking back and get these events on your wishlist, because we would love to run a game for you at the show. Throughout the con, we’re running a series of Play-and-Win events like this one. (This is just one of those events, but there will be lots more sessions of it running all show long.) What a “play-and-win” means is this: If you sign up for an event, you will automatically get a $10 coupon for use on any box game or book at our booth: The Ninth World, Apocrypha, Thornwatch, and The Maze of Games. 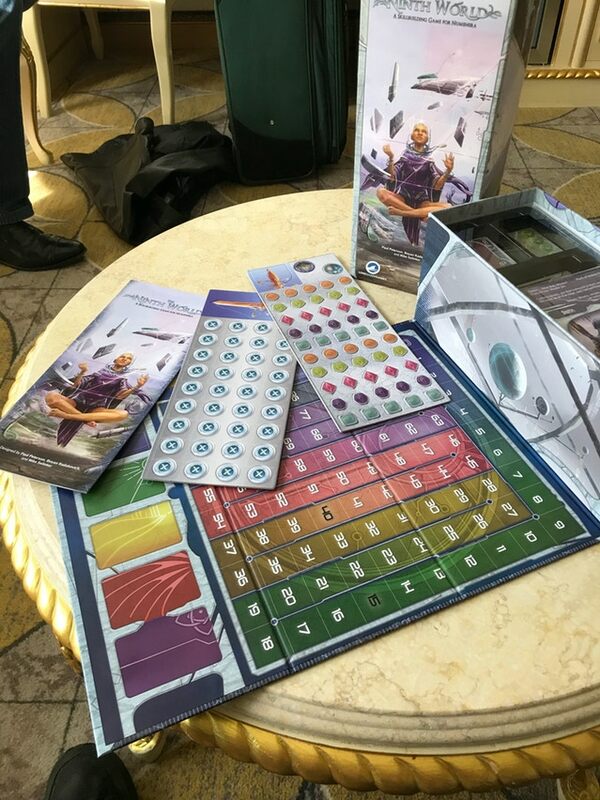 In addition, one player determined by die roll will receive a signed copy of the game they are playing, or can choose for it to be given to another person. You can sign up entire groups of people at a time, so this is an excellent opportunity to try to get someone else in your group a copy of the game. We also have a couple big interactive events: Apocrypha’s Snakenado! Reign of Venom and Thornwatch‘s The Unbound Knot. These are also play-and-win events, but with a story that jumps from table to table. They’re about half sold out now, so if you want to play, jump on those. It’s going to be a fun summer. Thanks for supporting our games!